I’m back at work making more adjustments to the drawloom. The way the loom was set up, there were good sheds on six of eight sheds/treadles, yet on two, there was basically no shed at all. The bigger issue, though, is the heavy counterweights that hang on the sides of the loom still are not pulling the shafts back into position. 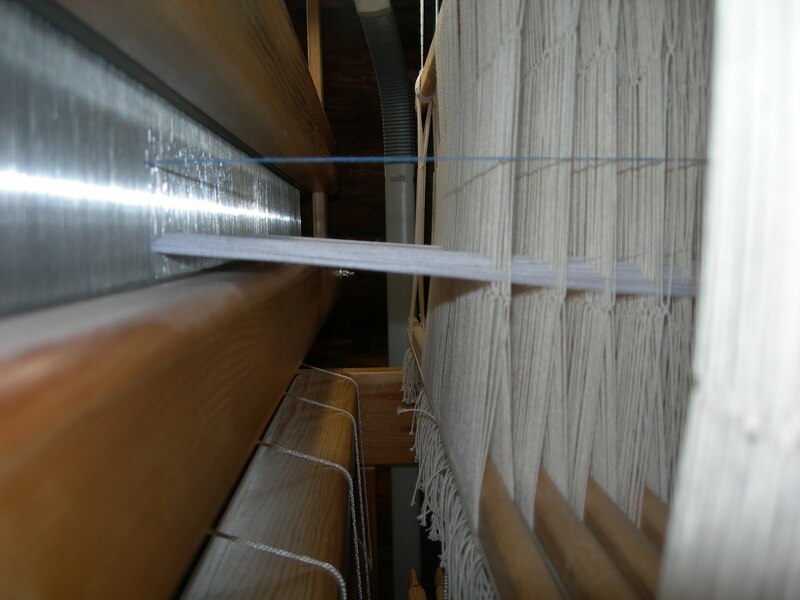 On a regular countermarche loom, all shafts move, either up or down, depending on your weave structure and tie-up. On a drawloom, one shaft is tied to raise, one is tied to lower, the rest stay in “neutral.” I’ve checked everything possible on this loom, over and over, and still have not been able to get the counterweights to work properly. So today, I am readjusting almost everything. Because the guide string was a little low, instead of going through the center of the long-eye heddles, I am lowering the ground shafts an inch or so. The goal is for the blue guide string to be centered in the long-eye heddles, and for the weighted ground warp to be resting near the bottom of the long-eye heddles. The photo above is very close (my angle when taking the photo might be off a bit). 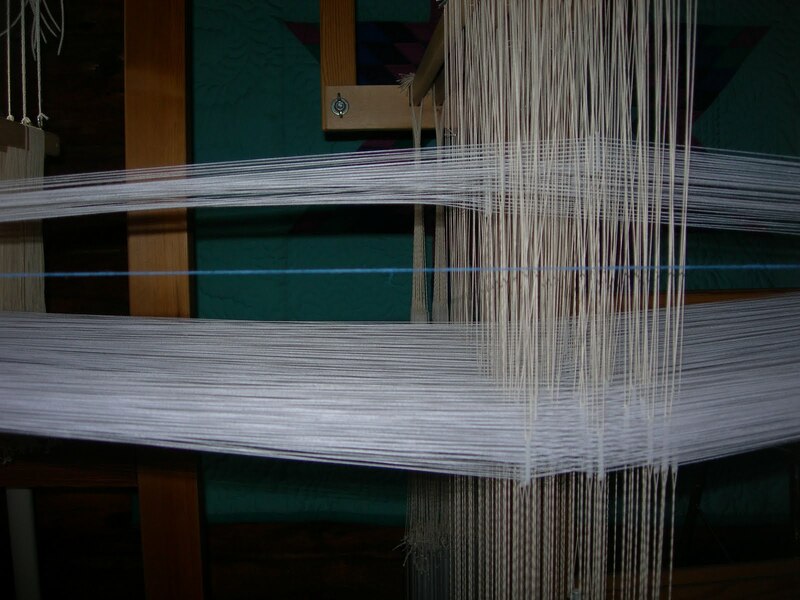 Then, when drawcords are pulled for pattern, looking at the drawn pattern heddles further back, the distance from the guide string to the at rest weighted threads should be the same distance as from the guide string to the drawn threads. This is what I am tuning up right now, and again have it very close (again, I didn’t get the photo straight on, sorry!). Reading again in “Damask and Opphamta” a couple nights ago, I read both upper and lower lamms should be parallel to the floor, so they will be adjusted next. (The information that came with my Standard CM states the lamms should be at specific distances from the floor, giving a slight angle up, which is how I’d set them on the drawloom. So they will be changed next. After changing the lamms, I’ll tie up the treadles again (only 2 cords on each treadle on a drawloom). Then I’ll tie the heavy counterweights back on, one tied to each horizontal jack on each side of the loom. Their purpose is to pull the raised and lowered ground shafts back to neutral. And this is what I have not yet achieved. There is a learning curve in setting up a double harness loom. 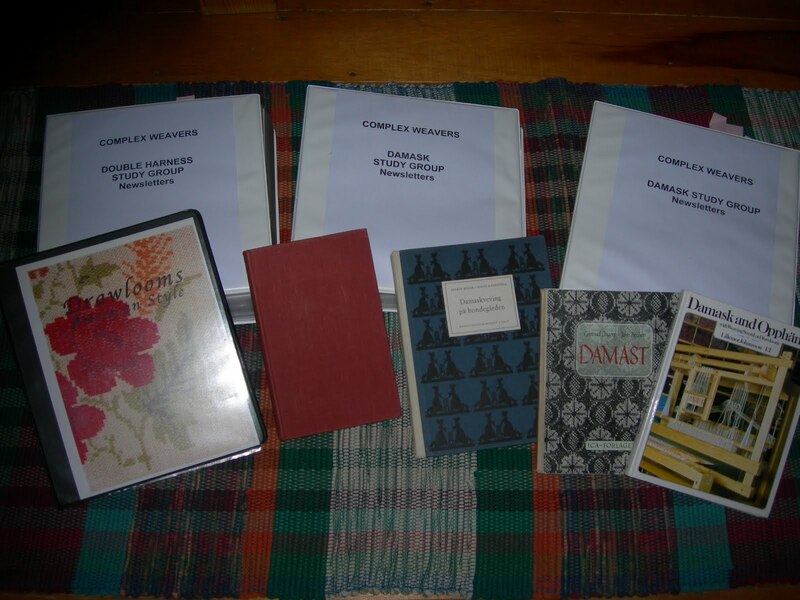 A couple years ago, I borrowed all the Damask Study Group and Double Harness Study Group back issue newsletters from the Complex Weavers Library to help me learn more about double harness looms and weaving. I find the old newsletters invaluable for reading others weavers experiences with these looms. They are also a help to me now as study group chair/newsletter editor. The single unit drawloom I am working on is a Glimakra 10 ground shaft/10 treadle, 4 shafts for pattern heddles, with the long extension, good for linen warps (in the future). I am using maillons on the pattern heddles instead of individual Texsolv heddles. My loom was made in the early 1980’s. 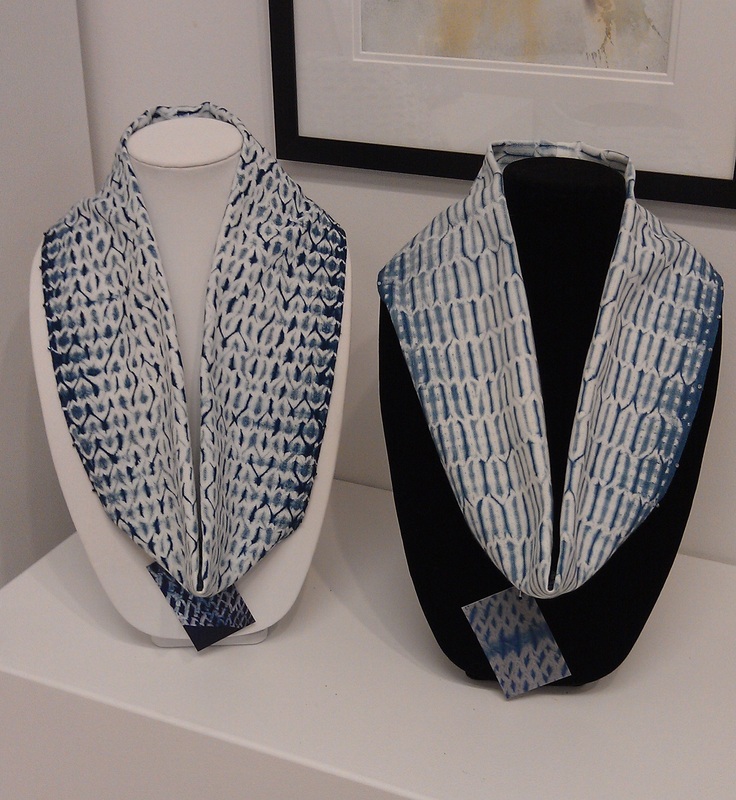 Available information on double harness looms is rather scarce, and weavers have a variety of types and brands of drawloom, making it a challenge to find weavers using the same loom you are working on. I do have several books on the subject, some in Swedish, but unfortunately, my ability to read Swedish is not good enough to understand much of the text. My goal, in the next couple years, is to travel to Sweden and take drawloom weaving classes, but for now, I must work here alone and try to work this out. I am, on occasion, in contact with other drawloom weavers through the CW Double Harness Study Group, and they have been most helpful with my questions. An international study group is a blessing! You constantly AMAZE me! What a job this is…..I'm sure that you will get everything as it should be. 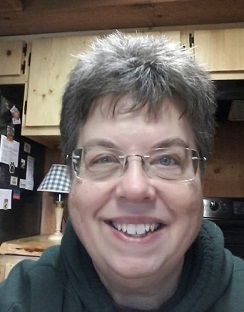 Glad to see you back online and posting! Good luck with the weights! I haven't had my drawloom up for a number of years. It has elastic cords not weights for bringing the shafts back into place. Stopping in to see how you are doing with the drawloom!